For my big vacation, I had a bit of a time figuring out how to pack for the trip. I’ll be gone for 10 days, I’ll be seeing varying temperatures, some days I’ll need to dress modestly and others more formally. On top of all that, I wanted to leave plenty of room in my luggage to bring home souvenirs. The first thing I researched was if laundry services would be available for my trip. I’m cruising with Royal Caribbean so I located their laundry service price list to plan out if laundry services were even in my budget. I also learned via Cruise Critic that Royal Caribbean has a wash-and-fold special where for $25 you can get as many socks, underwear, tees, shorts, swimwear, and pajamas washed as you can fit in the bag they provide. As part of our booking special we were given some on-board credit that can easily be applied towards laundry. 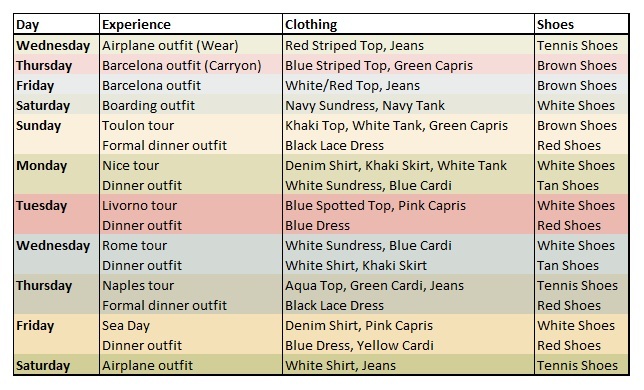 My next priority was to map out each day’s outfit needs. For example, day 5 of our trip will have us touring the Provence area of France for a short time, enjoying some quiet time on our ship, and then eating a formal dinner. So a touring outfit, a swimsuit, and a formal dress were all necessary for one day. Since I’ll be changing so much, I know I can get more than 1 wear out of most items. 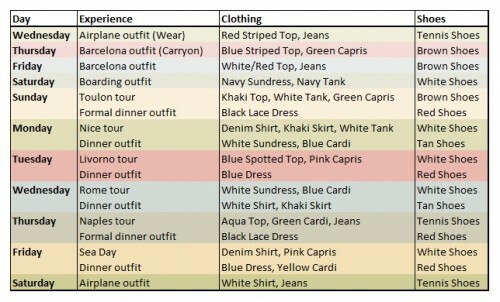 So I made a chart of my outfit needs for each day. I took some advice from Audrey over at Putting Me Together on the importance of wearing colored bottoms. I’m bringing 4 different bottoms but I can wear clothing for at least 10 days. I’ve actually limited my re-wears of key pieces simply because I don’t know how hot it might get or how clumsy I might be this trip. I tried to choose a color palette to work with for the trip too. I’ve always been a fan of navy and white and by sticking to a palette it means I can bring just 1-2 belts some brown and white shoes that should work with every outfit. My suitcase is basically filled with these key pieces, though some are just similar and not direct matches since I don’t buy a new wardrobe every year. what a great way to organize packing. I’m also a big Audrey fan – she makes everything look so effortless. have fun on your trip!